Non-residential construction costs will increase in 2016. Building owners and other construction project stakeholders should anticipate non-residential construction costs to increase 3% to 4% on average this year with most markets reporting robust activity and healthy employment in Q4 2015, according to Mortenson’s Construction Cost Index. The Minneapolis-based general contractor releases the index quarterly and it prices representative non-residential construction projects in six representative geographies throughout the U.S.
Mortenson Chief Estimator Dennis McGreal and Director of Design Phase Development Nathan Lingard recommended building owners and other stakeholders expect cost increases of 3.5 to 4% in 2016 for construction components such as structural steel and steel framing. Still, according to the report, all of the markets studied are considered healthy according to data from the U.S. Bureau of Labor Statistics. The Mortenson Construction Cost Index tracks building component trends in 30 categories with many component prices flat to moderately up in the fourth quarter of 2015. The labor shortage was a huge problem in construction in 2015. 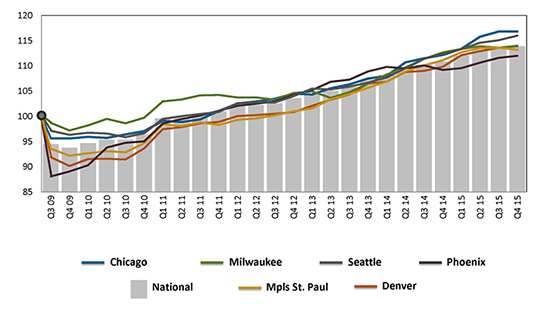 While the cost increases predicted likely won’t shelve any projects, the bigger news is that Mortenson is reporting construction employment growth has slowed in most of the metros it followed. A respite from the shortage could do wonders for labor costs for construction projects.